Brisbane Square has received the nation's highest environmental rating for its ecologically sustainable development practices and Construction Innovation scholar Judy Kraatz was involved in the Squares development, as Group Manager for the Architecture Group in Brisbane City Council. Brisbane City Council CEO Jude Munro acknowledged the efforts of Judy, a former Council employee, for leading our understanding of sustainability in buildings that led to many of the Brisbane Square innovations. Brisbane Square is now the largest high-rise office building in Australia to receive a Five-Star Green Rating from the Green Building Council of Australia. Some of the features that enabled Brisbane Square to achieve the five-star rating include the building being constructed using, for example, recycled materials such as goat hair, wool, cotton and hemp and an air filtration system that reduces pollutants in the office tower. The building's water-saving features also reduce our mains water consumption by 75-85 per cent by using river water for cooling the air conditioning system, on-site rainwater tanks and a sewerage treatment plant that recycles, treats and sterilises waste water. 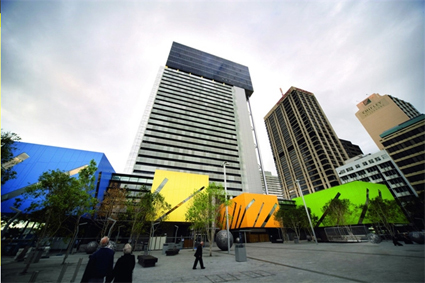 Brisbane Square also uses simple sustainable measures that can be applied in homes, such as using energy efficient lights, rainwater tanks, water efficient taps and recycling.